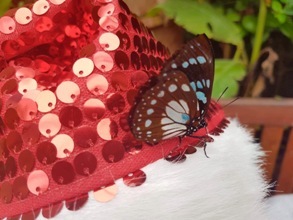 Celebrate a truly tropical Christmas at Stratford Butterfly Farm! With constant temperatures of over 25°C, the Stratford-upon-Avon Butterfly Farm is the perfect tropical place to escape the cold and celebrate Christmas this year! With plenty to see and do, the popular attraction is the ideal place to take family and friends during the festive holidays. On display in Minibeast Metropolis are a number of Rhinoceros Rat Snakes, also known as Gonyosoma Boulengeri, which originate from Southern China and Vietnam. They are so named because of their unusual scaly protrusion on the front of their snout. Relatively small in size growing up to a maximum of 1m in length, they eat mainly birds and rodents. One of the most popular residents with visitors this year was the Pumpkin Patch Spider which can also be seen in Minibeast Metropolis. This beautifully coloured Spider, which originates from Colombia, gets its name from its distinctive, brightly coloured orange and yellow abdomen markings. Although fairly small in size, this Spider has plenty of attitude! From 27 December - 6 January children and adults can take part in twice daily 'Meet the Mini-Beast' handling sessions in the Discovery Zone with the Education Team. Visitors can hold creatures such as a Madagascan Hissing Cockroach, giant African Millipede, African Land Snail and a variety of Stick Insects. The Nature Inspired Gift Shop is a treasure trove of gift ideas for all the family and the perfect place to look for stocking fillers and nature inspired gifts. Season tickets are also a great gift idea for family and friends and are available to purchase in the Gift Shop or to order by phone on 01789 299288. Anyone that purchases an annual season ticket between 17 November & 31 December will receive one extra month for free! Jane Kendrick, Marketing Manager at Stratford Butterfly Farm said "We have plenty to entertain all the family over the Christmas holidays and in lovely warm tropical conditions. Along with our Rat Snakes, Pumpkin Patch Spider, Meet the Mini-beast handling sessions, plus browsing in our fabulous Gift Shop, the Butterfly Farm has all the ingredients for a magical Christmas this year!" To see hundreds of spectacular butterflies, insects, reptiles and spiders visit the Butterfly Farm from 10am to 5:00pm, last entry 3.30pm. Open every day of the week except Christmas Day. For more information including admission prices and group rates, please visit the website at http://www.butterflyfarm.co.uk or telephone on 01789 299288.